West Indian piano wizard vigorously thumps away at keyboard in new Blues Festival – at least one audience member quite nicely set up for this. London has a new festival, ‘Bluesfest’, with the usual line-up of ‘not blues’ or ‘barely blues’ artists, as well as some real bluesmen, although few that I would call genuine (after the admittedly genuine BB King, the nearest is Portsmouth’s top blues star, Paul Jones). 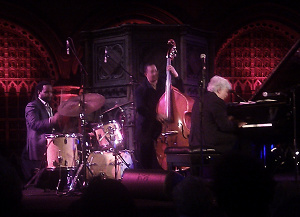 In the ‘not Blues’ category however, was a stonking, and barely noticed week at the Union Chapel. This commenced with the Monty Alexander trio, moved on to Roy Hargrove (missed, as I was at another event, but I have seen a lot of Roy Hargrove), then Al DiMeola (from where, waiting for the concert to start, I am typing this), and finishing with Ramsey Lewis (yes, he is still alive, and I’m going). The Union Chapel, with it’s rock hard pews, upstairs bar and no-alcohol policy is strikingly similar to the venue described in my earlier ConcertBev post, and I took the opportunity of this visit with A*ndy, to try out the method again, along with ConcertCushion, and a spot of ConcertDinner. This time I am delighted to report, things went swimmingly (in a non ViniBev-on-floor sense), with no spillages, a very comfortable backside postural situation, and a bl**dy great performance by West Indian born Alexander. Unfortunately the Concertbev container was leaking slightly on the journey to the venue, leaving a continuous dribble of Asda Shiraz wherever I went, and therefore maintaining the elderly wino appearance that has dogged me all the way on the ConcertBev story. But no matter, this was a major step forward in concert comfort. Monty Alexander, has a bit in common with another favourite jazz pianist of mine, South African Abdullah Ibrahim. They both are virtuoso, original artists, but they also bring a distinct flavour of their birthplace to their music, unlike the vast majority of straight-line jazz pianists, who sound clean and boundaryless (and therefore rather samey, although undoubtedly cool). Monty has a wonderful swinging Errol Garner like style and with his trio (including a particularly fine and melodic bass player), played a classic straight line set for much of the evening. But he also sang the ‘Banana Boat song’, (before tearing it up on the piano), and did a really great version of Bob Marley’s no woman no cry’ which I would not have tagged as a Jazz Standard. Here’s a short clip, taken with my phone, so pretty high on treble. But it gives you an idea, and might I hope, encourage you to see him when he is next in your town. BTW, you need Flash to see the video; if you are on Apple – so sorry. And if you can’t see the video, it takes a while to start streaming, so click on the picture and drum your fingers on the table, and it should then start.